Presumably referring to the criticism being heaped upon his latest film, Deliver Us from Evil, writer/director Scott Derrickson tweeted something out over the weekend, which really stuck with me. What Derrickson was essentially saying is that a movie need not be entirely original to be effective, but rather it simply has to be well executed – whether the general idea has been done a million times before or not. The Conjuring comes to mind when thinking of a recent horror movie that embodies that quote, as James Wan is skilled at making old tricks feel fresh and new. Though admittedly to a lesser extent, Mac Carter’s Haunt also fits the bill, rolling a familiar wheel pretty damn well. Released onto DVD on June 10th, and added to Netflix’s instant streaming service the very same day, Haunt tells the tale of the Asher family, who move into an old home that was previously the sight of much family tragedy. An evil entity resides in the home, and it’s up to Evan and his neighbor Sam to put an end to the house’s so-called curse, before tragedy strikes all over again. Unique among the hundreds upon hundreds of paranormal films that have come in the wake of success stories like Paranormal Activity and the aforementioned The Conjuring, Haunt is a character-driven movie above all else, with a pretty compelling relationship brewing at the heart of it. In many ways, it’s a teenage love story set against the backdrop of paranormal goings-on, which is both what drew director Mac Carter to the script and what impressed me personally about the film. 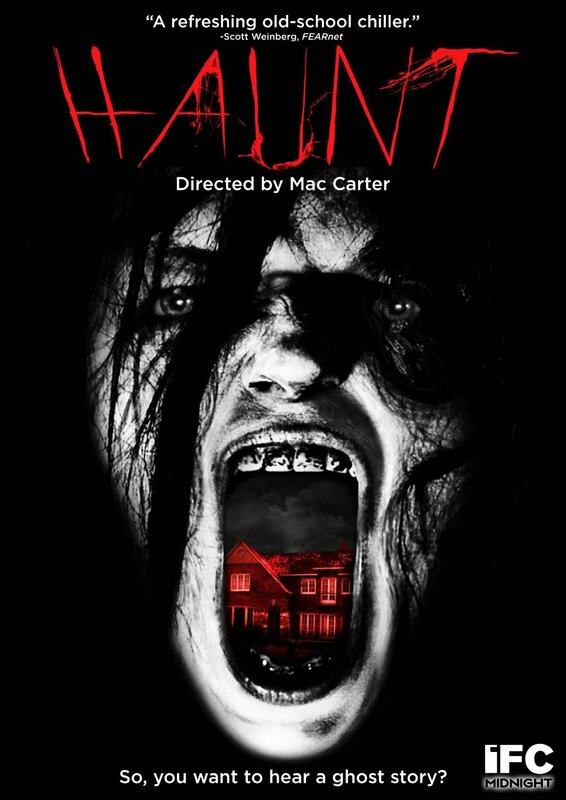 It kinda feels odd to type this, given that Haunt is of course a horror movie, but Carter’s directorial debut actually works best when it’s not a horror movie at all. In its best moments, Haunt is a story about ghosts rather than a ghost story, effectively tapping into the inherent human desire to prove the existence of things that dwell outside the realm of what we’ve been conditioned to accept as reality. There’s a moment in the film where Evan and Sam use an EVP machine in an attempt to make contact with the spirits that reside in Evan’s home, which ends up working – much to Evan’s surprise. While Sam is excited that they were able to successfully make contact, Evan is visibly shaken. “It worked,” he says to Sam, to which she remarks that yes, that was the whole point. “No, the point is to want it to work, then go ‘aw shucks’ when it doesn’t,” he retorts. It’s a brilliant bit of dialogue which really resonated with me, as Evan’s insight essentially sums up the human fear of/curiosity about all things paranormal. Like little kids playing with a Ouija board, we all want to experience paranormal things and then get terrified when we do, which begs the question of whether or not we really want to experience those things… and if so, why do we? What makes Haunt so compelling, and keeps the generic thrills and chills feeling fresh enough to make it worth a recommendation even to those who are incredibly tired of the paranormal sub-genre, is the relationship between Evan and Sam as well as their quest to dip their toes into those supernatural waters, with Evan terrified of what will grab his feet and pull him down, and Sam – at first, at least – excited and eager to find out if there truly is an afterlife. Unfortunately, whenever paranormal stuff actually does happen, with entities popping up from time to time to remind you that you’re watching a horror movie, those thrills and chills are almost entirely generic, to the point that you’ll likely be rolling your eyes when loud sounds are made and obvious jump scares are tossed in front of your eyeballs. There is some fairly creepy imagery throughout the film, including one entity in particular which is pretty nightmarish, but for the most part Haunt is your run of the mill ghost flick, when it chooses to be one. It’s a shame because you get the sense that Carter wanted to delve even further into the relationship between the two main characters, and their pursuit of the paranormal, but that he was perhaps pressured or felt the need to inject Paranormal 101 happenings into the proceedings, as much as possible. Could’ve definitely used some more of that character driven stuff, as that’s the material that makes Haunt most interesting. With solid acting from the leads, a nice atmosphere, some creepy scares and a story that allows for more than the paranormal terrorism of yet another cinematic family, Haunt is without question one of the better ghost movies I’ve seen in recent years, and a reminder that even an old wheel can still be rolled quite well. Mac Carter may not be James Wan, but for a feature debut Haunt is quite impressive, and I look forward to seeing more from him in the future. Give it a stream, whenever you next find yourself in the mood for a fun ghost story.